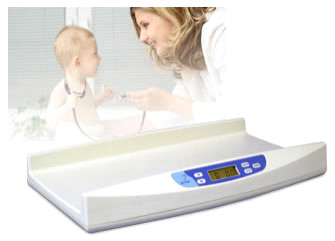 Doran DS4100 Digital Baby Scale w/ Reweigh Function. Designed for portability and accuracy, the Model DS4100 is the perfect choice for a traveling nurse or a pediatric office. Backed up by a three year warranty, the scale features a one-piece design that is sturdy and lightweight. With accuracy only found in more expensive scales, medical staff will now be able to track even the smallest weight changes with ease. The baby's weight is quickly "locked-on" and the weight is displayed in the large LCD read-out. A beep signals that the weight has been "locked-on" allowing attention be focused on the patient, rather than the weight display. The weight remains on the display until the Zero button is pressed or the scale is turned off. The Reweigh button, a feature unique to the Doran DS4100, zeroes the scale and reweighs the infant without removing the baby from the scale. Shane is a Registered Nurse and if you have any questions about this clinical scale, please call us Toll Free at (800)355-2956 or (701)223-9936.